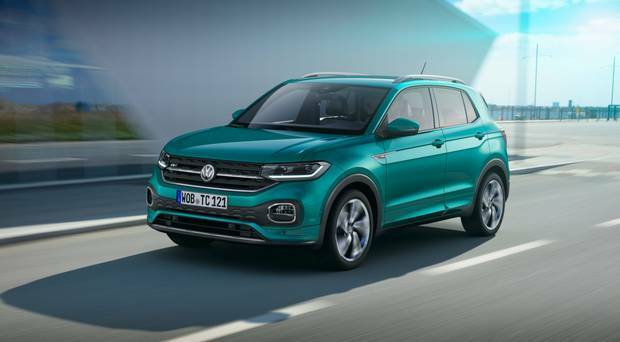 I expected the new Volkswagen T-Cross to be more of the same: another small urban crossover that ticked the nominal usual boxes. It was ‘more’ alright but not of the same. Before I explain, let me give you some background. Volkswagen is only the latest to respond to the phenomenal demand for these small urban motors. This T-Cross is their smallest SUV/crossover to date. It will cost from €22,495 when it arrives here towards the end of next month. Ostensibly smaller than the popular T-Roc, it is 4.11m long (12cm shorter than bigger brother). It is built on the famous MQB platform, is 54mm longer (4,110mm) than the Polo supermini and 138mm taller (a key attribute). The luggage compartment holds between a lowly 385 litres to a respectable 455 litres because the sliding rear bench can be moved to extend or lessen boot/passenger space. And if you fold the rear seats you get a whopping 1,281 litres. The big attraction with these cars is the (relatively speaking) high-driving position; in this case those in the front sit 597mm above the road. Rear passengers get a bit more height at 652mm. There will be three engines from launch: a 1.0-litre petrol with 95hp (112g/km), a 115hp (111g/km) version of this from €24,495, and a ‘new’ 1.6-litre 115hp diesel from €25,295. The 115hp petrol is best, I think. Entry level trim is known as ‘T-Cross’ but few will bother – it is designed to get you into the buying ballpark. The ‘Life’ (from €24,550) and ‘Style’ (from €26,795) trims are the real buying options; less so the ‘R-Line’ (€27,995). Spec includes 16ins alloys, 8ins infotainment system, App Connect, Climatronic air con, 2 USB interfaces front and back and Adaptive Cruise Control. ‘Style’ adds 17ins alloys, LED headlights and a ‘chrome package’. Range-topping ‘R-Line’ gets special 17ins wheels, and R-Line interior/exterior package (option of 18ins wheels). There are myriad bundles of spec to individualise cars, something a growing number of people like to differentiate their vehicle from the pack. More anon. As I said, I was prepared for another small-SUV-by-numbers when I started my test drives in this. Instead I was pleased to find quite a successful blend of the practical and the pleasant inside and out. For a start it has a cabin that feels as roomy as the larger, and more expensive, T-Roc. Even I (6ft 1ins) wasn’t squashed in the rear seat. I think they have devoted more room to that department than the T-Roc which has a larger boot but not as proportionately spacious rear seating. It has a nicer dash and cabin too (thanks to one of those packages I mentioned). But above all there was a sense of space through the cabin; the high roof played a big part in that. Combined with a suspension set-up that largely nullified and muffled road noise and scars, the feeling was one of larger-car comfort. It isolated bumps from the cabin, yet the steering was true and direct. I must say I enjoyed my drives a lot (not so much the diesel though). I like the shape of it too; I think it looks more like a little SUV than the T-Roc and many existing rivals such as the segment leader Renault Captur. The idea of ‘more’ extends beyond the physical manifestations. With an effective starting price around the €25,000 mark (excluding the virtually non-existent ‘T-Cross’ entry) it is out of kilter with the prevailing prices for most rivals. Volkswagen will no doubt claim spec, build and better quality materials justify the difference. Maybe they do, in part, but so does their ‘premium’ pricing structure. And no doubt PCP repayments of a few euro extra a month blur the price gaps anyway. They expect around 400/450 to buy one this year – 1,200 next. As is increasingly the case, there are several bundles of ‘individualisation’ items which cost less collectively than if you bought them separately. There are technology upgrade packs (€499 ‘Life’/€799 ‘Style’ and ‘R-Line’) and design packs for ‘Life’, ‘Style’ and ‘R-Line’ versions. In ‘Life’ they include 17ins Manila wheels in design-pack colours (black, ‘energetic orange’ or ‘bamboo garden’). I liked the orange colour theme in our first-day test car. And there are exterior mirror housings in design-pack colours, tinted rear windows, sports comfort seats, different dash-pad design, fabric seat coverings; the same for the centre console. For ‘Style’ and ‘R-Line’ models, for example, you can get 18ins Köln alloys in special colours. The combinations are so numerous but should mean you are unlikely to meet too many cars decked out as yours. If you are among the growing number looking for something different like this, I think you should ask your dealer for some of the brighter colours and combinations. I suspect silver and grey will otherwise predominate in showrooms. I think it’s a car that deserves a bit of visual life. As a stand-alone motor, the T-Cross ticks more boxes than most. It has something that’s missing in many: a bit of smart drive and style. It just has that bit ‘more’ about it.